Delicious pots of hot chocolate pudding with a choice of surprises in the middle. 1. Preheat the oven to 220 ̊C, gas mark 7. Grease 8 mini pudding moulds (about 150ml in volume); dust with cocoa. Melt the butter and chocolate in a bowl set over a pan of simmering water or the microwave; leave to cool for 5 minutes. 2. Using electric beaters, whisk the sugar, eggs, yolks and vanilla for 5 minutes, until thick. Stir 1/3 into the chocolate mixture, then fold in the rest. Fold in the flour and a pinch of salt, until just combined. Fill the moulds 1/3 full; top with 1 tsp Lotus spread or peanut butter, or 1 Lindor ball. Top with the chocolate mixture to 3⁄4 full. 3. Bake for 8 minutes; rest for 2 minutes before serving. 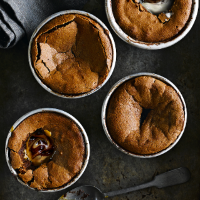 You can also chill the puddings for up to 12 hours and bake straight from the fridge for 12 minutes.